Latest post Fri, Nov 8 2013 12:03 AM by Mondo. 10 replies. Simple question, where does AVID store the DB for the AMA files? Hoping it's not the drive with the AMA Files..
And if so, is there any way it can be shut off so that it doesn't create a database for AMA files? Avid does not do the same thing with AMA-linked clips as it does with it's own MXF clips. Avid's media is stored in said database and tracked inside, but AMA-linked clips use file path and file name to track media. So it's not really adding assets to the database inside the Avid Media Files folder, just simply retaining the source file name and path. Well, I think I read some where that with MC 7, there is some type of AMA database going on now. Not sure if that is true or what the story is. I guess it makes sense - I know with Avid Interplay Version 3.0 their allowing AMA'ed files to be checked-in to Interplay, but I think that uses the same concept with the file path. But where that database file itself is being retained, I do not not. It may just be an extension into the database file with Avid Media Files folder. Do you know where you read / heard that? I'd be curious to read that myself. On my Mac-based system, they are here. Note that they are named "amaFMID.pmr" and "amaMMOB.mdb", instead of "msm..."
Interesting! So it looks like you're right, it does create a separate DB file for the AMA and stores it within your local drive where the application is stored. I'm guessing you answered you're own questions then? 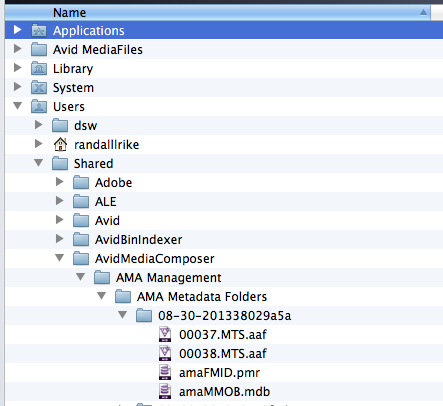 Did you create the AAF files, or was that created by Avid (and do those names correspond with the names of your media)? It looks like Avid just utilizing AAF matched with the DB file to track the assets. I wonder if you can change where that DB file is saved. I wonder what happens if you delete the AMA database? Can it be fully reconstituted or will you have permanent data loss. In other words, is this another folder that should be backed-up? Great link. Sounds like the developers have a bit more work to do to round-out the AMA data management feature. And this one - seems you can dlete it without any impact..